The December meeting will be on Thursday, December 6, 2007, and will be our Annual Christmas Party. Please note that the Christmas Party will be at the VFW again this year. The menu will include Roasted chicken, Fried Pork Chops, dressing, corn, green beans, cranberry salad, slaw, rolls, and assorted desserts. Cost will be $10 per person. Call Ruth Wibbels at 482-5403 or Virgil Gress at 482-2524 before December 1st to make your reservations for the Christmas Party. Reservations can also be made during the November meeting at the Sign-In table or via email to Ruth at wibbels@fullnet.com. The program will feature Recycled Teenagers...direct from St. Anthony, Indiana! This group, under the direction of our very own Birnie Jeffries, specializes in reminiscing about their teenage years! They sing a variety of 50s and 60s songs and sprinkle in a joke or two to tickle your funny bone! The January meeting will be on Thursday, January 17, 2008 at the VFW. As has become our custom, this meeting will be our annual beer and wine tasting/judging gathering. Members are encouraged to bring samples of their beer and wine making for the annual competition. Categories will be judged in Grape Wine, Non-Grape / Other Wines, and Beer. The club will provide canned drinks and a variety of cheese samples. There will also be a cash bar available for anyone wishing to purchase mixed drinks. More Information to follow in the next newsletter. Look forward to a great time at the January meeting! The February meeting will be on Thursday, February 21, 2008 at the VFW. This is the month we will be giving our sweet hearts or special friends an evening of fun and great entertainment. We are planning a great meeting for that special night. Stay tuned for more details in the next newsletter. Introducing Erin Doboze, JHS German and English Teacher. Erin was raised in Seymour and currently resides in Evansville. She graduated from Seymour High School in 2003 with Honors and graduated in 2007 from Indiana University with a degree in German Secondary Education. She did her student teaching at Thompkins Middle School in Evansville last spring. During college, Erin worked at Indiana University’s Indiana Memorial Union Catering Company. 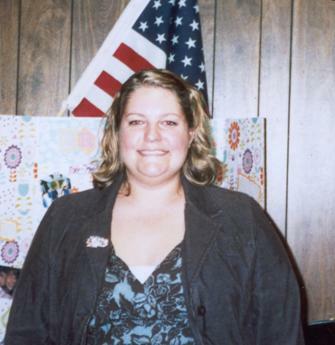 She traveled to Europe in 2000 and in 2002 with other students from Seymour High School and spent approximately three weeks each trip visiting various countries in Europe. In 2005, she lived with a host family in Graz, Austria for two months and studied there. She learned much about the southern culture during her time there. Her hobbies are visiting family in Seymour, spending time with her fiancé and his daughter, reading, swimming, and walking. She states that there are members of the JHS German Club that aren’t in German. “It’s nice to see that the student body is joining clubs they are interested in, but not know a lot about. I hope to continue the trend. As for as the Exchange Program, I hope that student continue their interest in their ancestry and want to participate in the Exchange Program” says Erin. Below is some information about our new CD, the Dec. 9 performance from it that Monika and I will give at the Dubois County Museum, and other events at which we’ll promote the project. Monika and I appreciate the support of everyone who comes out to hear us perform. We are aware that combining jazz and poetry doesn’t exactly fill stadiums (even though what we do is quite mainstream, as you’ll see below). We appreciate the privilege of performing together to share something unique that celebrates Indiana and its heritage and would welcome your spreading the word. You have our permission to invite Santa and all his helpers to the party! Monika will be including some German Christmas songs when she performs occasional instrumentals. Norbert Krapf and Monika Herzig will perform from their new CD Imagine – Indiana in Music and Words (Acme Records) on Sunday, Dec. 9 at 2:00 p.m. at the Dubois County Museum. A suggested $5 cover charge will qualify people for a $5 discount off the regular $15 CD price. Norb and Monika, a pianist, will perform their pairings of poems and musical compositions, some of them originals by Monika and some arrangements of traditional tunes, such as German folksongs and Beethoven’s “Für Elise.” Monika is a native of Albstadt in Swabia, Norb a native of Jasper, and their German heritage figures in several poems. They also perform a new tribute poem in memory of the late Indiana author Kurt Vonnegut, “A Pilgrim Unstuck in Time,” that has Monika playing the folksong “Die Gedanken sind frei” and “Ode to Joy” from Beethoven’s Ninth Symphony. The CD includes poems in response to work by John Lennon, Paul Simon, and Bob Dylan. Imagine – Indiana in Music and Words , which contains 15 tracks totaling 61+ minutes, includes tributes to the jazz musicians the Hampton Sisters and poet Etheridge Knight of Indianapolis, Hoagy Carmichael of Bloomington, and the southern Indiana hill country, the setting of many of Norb’s poems. A 20-page booklet includes the texts of all 14 poems recited on the CD, a collage of color performance photos, and images related to the subjects of the poems. The colossal, lighted Christmas tree in the center of downtown Jasper welcomes shoppers to the annual Jasper O’Tannenbaum Days celebration November 30 - December 2. Guests will enjoy unique shopping, carolers, visits with Santa, free carriage rides, church bazaars , cookie walks, and the “Lights of Hope” holiday home tour benefiting the American Cancer Society. Special performances include the Celebration Singers and “A Christmas Survival Guide”, both taking place at the Dubois County Museum. Features include gingerbread cookie decorating, talented artists and artisans demonstrating their skills of wood-carving, pottery, quilting, and butter-churning inside the shops, special events at the Train Depot and tours of St. Joseph Church, an 1880 Romanesque, olde world-style church listed on the National Register of Historic Places. Enjoy German entertainment from the Street Organ Grinder played by Ted Guillaum of Nashville, Tennessee. The traditional Street Organ maintains all the olde world charm of producing automatic music simply by cranking the handle and includes nine Flute Pipes that can be turned on and off at will for an extra musical effect. Guillaum will present an afternoon musical performance in traditional German costume using a new instrument that was custom made in July of 2003 by Josef Raffin Organ Company located in Uberlingen, Germany. He will entertain visitors in Jasper’s downtown area from Noon to 4:00 p.m. on Saturday, December 2 and on Sunday, December 3 between 1:00 and 4:00 p.m at the Train Depot, located at 2 nd & Jackson Streets. Visitors may board the train between 1:00 and 4:00 p.m.
For more Christmas cheer, visit the Historic Barn at East 4 th Street Sunday afternoon for a live nativity scene. The barn, which was recently re-constructed, was built according to the barns in Germany at the time, complete with a sandstone foundation and native timber. It will be open throughout the afternoon after 2:00 p.m. for visitors to view it and take pictures with a camel and other animals that are part of the live nativity scene. A progression from the Gazebo to the barn will begin at 4:30 p.m. Christmas carols will continue until 6:00 p.m. For more information, call the Dubois County Visitors Center at 800-968-4578 or go to visitduboiscounty.com. The IGHS 24 th Annual Meeting and Symposium will be held on Friday evening, March 14 th, and Saturday, March 15th, here in Jasper. The Friday evening dinner and program will be held at the American Legion in Jasper. The Saturday morning program and luncheon will be held at the Dubois County Museum. The public is invited to the dinner, luncheon, and programs and reaffirm their dedication to our German heritage. Details and costings of the events will be announced at the December Deutscher Verein meeting and available in the next newsletter and published in the area newspapers. If anyone has any questions, they may call Patti Goepfrich at 482-4821. The chili supper will be on Saturday, February 2 nd. More details will be available later. Mark your calendars for this annual fundraiser!!!! Deutscher Verein and Sister City Golf Shirts may be ordered and purchased at Jasper Embroidery, 310 Main Street, Jasper. They can also embroider the American Flag and the German Flag on shirts. What a great way to display your German heritage. These could also make great gifts. Lapel Pins with the Jasper/Pfaffenweiler Logos and Wooden Coasters – Great Gift Ideas!!! Lapel Pins and Wooden Coasters are available in the Gift Shop of the Dubois County Museum. These would make nice gifts holiday gifts. The Wooden Coasters are also available at Jasper City Hall, the Jasper Chamber of Commerce, Steins Signs–N-Gifts, and the Schnitzelbank Gift Shop. The four designs of the coasters are the Jasper Train Depot, Eckert Mill, St. Joseph Church and the City Hall. The coasters can be purchased individually for $5 each. They are also offered as a set of the four designs resting in a wooden base for $25 per set. The profits will benefit the Jasper High School German Exchange Program. These are a nice gift for anyone and can be a holiday gift for family and friends in Germany or outside of the area. If someone knows of a potential new club member and would like information about the Deutscher Verein forwarded, please contact Ruth Wibbels at 482-5403 or Rita Egler at 634-9068. Please remember to return any empty beer bottles from the Picnic to Bob Sunderman or Matthias Hilger. The following is a series of articles that appeared in The Dubois County Daily Herald in 1957. These articles also appear on the DeutscherVerein website. Enjoy!!!! Jasper’s downtown area was a beehive of activity today as final preparations were being completed for the six-day Pioneer German Days celebration which opens this afternoon. The “market place” booths around the square and the Relic Museum and Book and Document Gallery were expected to be in operation right after dinner with the official opening set for 5:30 on the west side of the courthouse. In addition to the opening ceremonies at 5:30 P.M. it was announced that another special program will be conducted at eight o’clock this evening from the west portico of the Courthouse. It was anticipated that there will be some citizens in costume on the Public Square this evening. The Madeleva Literary Club of Jasper has issued a request for more books and documents for its display at the German-American Bank Community Room. The items will be catalogued before being put on display. Anyone having such items and willing to lend them should call Mrs. Omer Kuebler. Many retail stores have unusual window displays. Tewell’s Shoe Store has devoted one of its display windows to an exhibit of shoes worn in bygone days. The display, entitled “Shoes Through the Ages,” was rented from the International Shoe Co. of St. Louis. Sermersheim’s Auto and Home Supply Store has a window full of dolls, arrayed in many styles. All but one are from the collection of Mrs. Guy Lambert of Jasper. Included in the market place around the Public Square on Tuesday will be the Grandmothers Club’s “Kaffee Klatsch” in the southeast corner. The Grandmothers will be open for business at nine A.M. with genuine old-fashioned kuchen and doughnuts and coffee. Later they will add ham sandwiches, German Style slaw, German potato salad, hot dogs and soft drinks to their menu. The Astra theatre has Western movies slated at ten o’clock Tuesday morning, mostly to keep the small fry occupied while mom and dad take in the rest of the festival. The Kiwanis Club’s “Kinder Karnival” switches the spotlight to Armory Park at one in the afternoon where the usual variety of kiddie rides, special events and refreshments will be provided through the rest of the afternoon and evening. Back on Public Square, the Astra has a German movie, “Der Foreliche Weinberg” booked for Tuesday afternoon and evening. The old fashioned “Schwaben picnics” are scheduled for Tuesday night at Armory Park and elsewhere. Following the evening’s regular meeting of Jasper Council 1584, Knights of Columbus, there will be a program of special musing in keeping with the Pioneer German Days celebration. Entertainment will be furnished by the “Jasper Deutsche Dorf Kapelle” (Jasper German Village Band). This is a local group directed by Herman Kiefer. The public is invited to the musical program, which will begin around 8:30. It has been announced today by Radio Station WITZ that they will offer the listeners a variety of broadcasts throughout Pioneer German Days along with German music that was sent to WITZ direct from Germany plus several tapes from various communities in Germany. WITZ’s broadcast week will begin on Monday evening at 5:15 P.M. and they will carry the formal opening of Pioneer German Days direct from the Square in Jasper. On Tuesday and Wednesday afternoon they will have various broadcasts originating from the square in Jasper during the Koffee Klatsch and other activities that will be in progress. On Thursday, July 4, they will be broadcasting from Breidenbaugh Bros. in Jasper where WITZ will be tuned to Breidenbaugh’s two-way radio system to report to the listeners the progress of the parade. Breidenbaugh will have several of their mobile units in the parade and will broadcast at various times throughout the length of the parade as it moves from Cannelton to Jasper. This will give people a first hand account of the parade as it progresses without having to stand in line too long to await its appearance in Jasper. After the parade reaches Jasper, WITZ will be broadcasting from the reviewing stand at the Stewart Hotel and also from the Square. Also on July 4 WITZ will have German programming from 10:15 A.M. to 11:30 A.M. and this will include German music that was recently sent to WITZ from Hamburg, Germany, and the tapes that were sent by radio stations in Stuttgart, Bremen, and Berlin, Germany. The tapes from Stuttgart and Bremen are in German and then are followed with an English translation. In addition, throughout the week, WITZ will have its station breaks on the air in German. The broadcasting throughout Pioneer German Days will come to a close when WITZ covers the closing ceremonies on Saturday at 5:15 P.M. from the courthouse. Thank you for all of your support with our Exchange. We all enjoyed it. I hope this program will continue with great success. I plan to continue studying German at the University of Southern Indiana. Danke Schoen – Thank you very much!!! Cut beef into 3/4" to 1" cubes. Heat lard or fat in 3 quart saucepan and sauté onion until golden. Sprinkle with paprika and sauté a minute or two, stirring constantly over very low heat. Add beef and star around well in paprika and onion mixture. Let meat sear and brown very slightly. Sprinkle with salt, pepper and vinegar and stir in tomato paste. Simmer 3 or 4 minutes, then add caraway seeds, marjoram, garlic and water. Bring to boiling point, cover and simmer gently 45 minutes, or until meat is almost done. Add diced potatoes and cook slowly 15 to 20 minutes longer, or until meat and potatoes are thoroughly cooked. Check seasoning and serve in deep bowls. Enclosed is my gift of $___________. Please direct my gift to the __________________________________ Endowment (Please specify appropriate Endowment).